Mahmoud has six years of local and international experience in corporate finance, banking, project finance including Islamic finance, capital markets, M&A and PPP projects. He participated in negotiating and drafting several of the most significant project finance and capital markets transactions in Egypt. 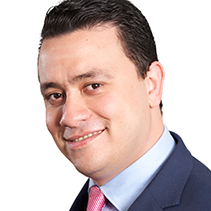 Before joining Hadef, he worked at Sarie El Din & Partners in Cairo and previously at Nadoury & Nahas Law Office in Alexandria. Mahmoud obtained his law degree from Alexandria University in 2005, and subsequently an LLM in International Commercial & Business Law from Robert H. McKinney School of Law, Indianapolis, USA in 2010. He is currently studying for a Diploma in Islamic Finance with the Chartered Institute of Management Accountants. Hadef & Partners was once again awarded Domestic Deal of the Year at the IFLR (International Financial Law Review) Middle East awards.